Whether it be a new arcade title or downloadable content for your favorite blockbuster, this weekend is hot with great games! Nick "bapenguin" Puleo - "I have an enormous back catalog of games I want to complete/play including but not limited to: Trine, ArmA II, Transformers 2, Monkey Island SE, Madballs, Splosion Man, Marvel vs Capcom 2 and Civilization Revolution. " Marc "DjinniMan" Allie - "Dawn of War 2, Guitar Hero Smash Hits, Wii Sports Resort, Horde Mode Gears 2 on the new maps, 'Splosion Man, etc. I'm considering Marvel vs Capcom 2, also. And Ninja Turtles next week... eek. Looks like the fall rush started early this year." 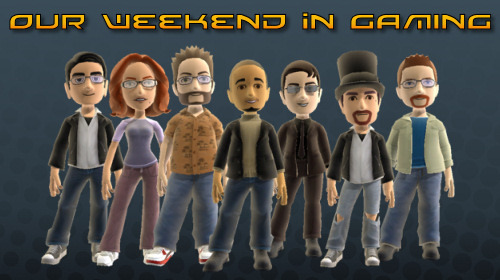 Katrina "ShadokatRegn" Pawlowski - "Weekend of arcade: 'Splosion Man, Madballs, and some DLC fun with Gears of War 2!" Jason "OrigamiPanther" Love - "I feel in a bit of a lull right now with games until the fall releases hit. I think I'll be diving into some of the games that I've let sit for too long and try to pick up Persona 4 again. Talk of Gears 2 and DoW 2, though, has made both appealing, so maybe I'll break up my bouts of solving murder mysteries in rural Japan with some co-op fun." Jim "txshurricane" McLaughlin - "Probably plenty of Call of Duty 4 and World at War for me...maybe a few Guitar Hero World Tour riffs and a few matches of Ghostbusters co-op." Page created in 0.6179 seconds.